He laughed and stepped into the shadows to stand beside me. I could feel the warmth of his body just inches away from mine and I had to fist my hands to keep from unfolding my arms and touching him. He still wore his stage outfit, long sequined pants in a gaudy camouflage pattern with a tight fitting vest to match. 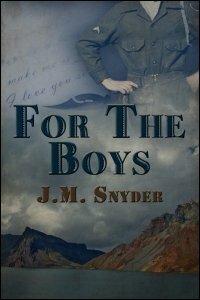 The pants hugged his hips and thighs, blooming out around his ankles, and in the faint light from the window of his friend's tent I could see the freckles on his bare shoulders, the thick muscles in his upper arms. He wore a small cross on a tiny gold chain around his neck and his hair was a mop of unruly brown curls the color of freshly turned earth that my fingers itched to roam through. When he smiled, I could see the sparkle of glittery makeup around dark eyes that twinkled like the stars above. "She is cute," he said. "Did you see our show?" I nodded, awed, afraid that my voice would be gone if I tried to speak. No wonder the nurses were giggling over him earlier. This close he was breathtaking. "The guys always fall for her," he continued. "I'm Tommy." "Tommy?" I asked, confused by his sudden change of topic. He grinned. "That's me," he said. "Don't you think she's cute?" I shrugged. "She's okay, I guess. Not exactly ..."
I trailed off, unsure of how much I wanted to tell him. Everything, my mind whispered, but I didn't listen to it. Tommy laughed. "Not exactly your type?" He took a step closer and the front of his vest brushed against my elbow, igniting my arm at the brief touch. "What is your type?" I didn't answer, but my whole body cried out for him and when he touched the insignia on my shoulder, I almost jumped. "What's this stand for?" "Warrant officer," I whispered, watching his finger trace the metal bar pinned to my jacket. With a grin, Tommy lowered his voice and asked, "Does this warrant officer have a name?" "Prosser," I told him. He looked up at me, eyes widening, and I remembered he was a civilian. "Carl," I corrected. I could feel a blush heat up my cheeks and I turned away from his intense gaze. "It's Carl." "Carl." When he sighed my name, it sounded like a promise. Glancing at the door to his friend's tent, still closed, he asked, "So you're just waiting here?" I stared at the skin along his neck, the shadows pooled in the hollow of his throat, and nodded because I didn't trust myself to speak. He shivered in the night air and I wanted to wrap my arms around him, hold him close, cover those bare arms and warm him up again. "It's getting colder," he said with a slight laugh, but he didn't move away, didn't say he had to leave, didn't make up an excuse and hurry on his way. Instead he rubbed his hands together and asked, "Where are you from, Carl?" I liked the way he said my name, the way it sounded in his voice. "Southwest Virginia." He laughed again. "You're a far way from home, boy. I bet it gets pretty lonely out here." "You have no idea." Lonely didn't begin to describe Korea. Some nights, when the wind whistled around the flaps of my tent, I would lay awake on my narrow cot and listen to Bert snore, and wonder if maybe I wasn't wasting my time out here, wasting my life for a war that the government refused to declare. Nights like that I wanted to be home, in the heat of the South, and I clutched the blankets tight around my body and ached for a lover's touch. Then there were days when I was trying to get the wounded off the battlefield and could hear the steady ping of enemy bullets off my chopper blades, and wondered if I would ever even make it home again. Tommy watched me closely -- I could feel his gaze on my face, my neck, and I was all too aware of his naked arms and his thin clothing, sequins and silk, when I stood next to him in heavy fatigues and a thick field jacket. "I'm sure you have someone back home who misses you," he was saying, his breath warm against my cheek. When had he moved so close? "Someone who writes you long letters, cheers you up a bit. A girlfriend maybe? Someone like that?" "No." I shook my head for emphasis. "No girlfriend." I didn't want to tell him that the only letters from home I got came from my mother or my sister. No lover, and definitely no girls. "Not your type?" he breathed. Staring into his deep eyes, I whispered, "You could say that."